Dal's College of Continuing Education, based in the Mona Campbell Building, hosts the university's English as a Second Language (ESL) programs. Dalhousie is known for the diversity of its students, and the College of Continuing Education is easily one of the most diverse academic units on campus. That’s because the college develops and delivers educational programs for three very different groups. For individuals looking for a path to undergraduate studies, our Pathways programs offer a number of options — from courses to fulfill program prerequisites to a wide range of English as a Second Language (ESL) programs that let you start at your current language level and progress to the level required by your chosen degree program. For individuals looking to prepare for and succeed in their careers, our Professional Development programs are designed to enhance expertise, keep current with recent developments in your field or help you stand out in the job market. Our course offerings include certificate programs in many specialized areas of study — programs that are popular with those who are shifting gears, including those who want to build, advance or change careers. Then there are our employer programs, which focus on organizations looking to invest in their staff to expand capacities. Across the board, we strive to offer engaging learning opportunities that will enrich your life, advance your education or career and help you make positive contributions to your communities and organizations. 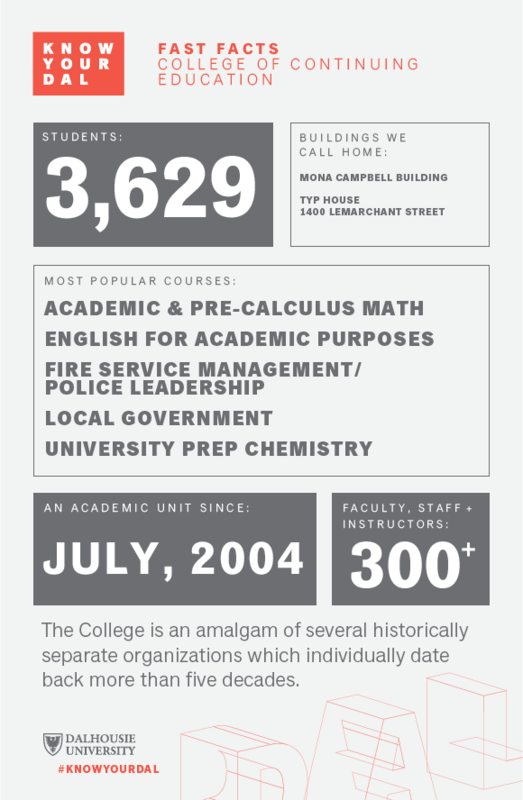 Here are five things that you might not know about the College of Continuing Education. 1. We assist hundreds of students to access credit programs at Dal each and every year. From 2010 to present, the University Pathways Division of the College of Continuing Education has provided service to 3,839 students and has recorded 5,056 individual registrations. Courses/programs within this division include: the Transition Year Program, the University Prep Program (including: Writing Skills for Academic Study, Academic Math, Pre-Calculus Math, University Prep Chemistry, Biology, Physics), English as a Second Language (including: English for Academic Purposes, IELTS Preparation Courses, Summer English in Canada and courses/workshops for Dalhousie students on improving English skills) and Refining Your Learning Skills for Academically Dismissed Students. 2. 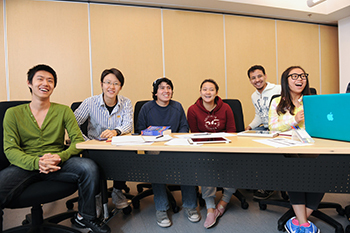 We’re a “home away from home” to Dalhousie’s hundreds of International ESL Students. We began offering offer ESL programs in 2010. These include: English for Academic Purposes, IELTS Preparation Courses, Summer English in Canada and courses/workshops for Dalhousie students on improving English skills. Since then, we have assisted approximately 2,000 students from a wide range of countries: China, Korea, Japan, Vietnam, Kazakhstan, Saudi Arabia, Iraq, Iran, Qatar, Yemen, UAE, Kuwait, Jordan, Israel, Turkey, Libya, Egypt, Ukraine, Spain, Norway, Germany, Greece, Russia, Chile, Ecuador, Colombia, Brazil, Venezuela, Mexico, Bolivia, Cuba, Burkina Faso, Tunisia, Peru, Lebanon and the USA. And our instructors are almost as diverse as our students: they speak a combined total of 10 different languages. 3. Our dean, Andy Cochrane has been known (on more than one occasion) to say, “Shift happens!" With 33 Certificate Programs and over 250+ courses — delivered online, face-to-face and via blended delivery — we develop training solutions for individual clients, groups, organizations and/or workplaces where we match desired knowledge to the learning required. We assist those who want to build, advance or “shift” careers. We provide learning opportunities here, there or anywhere. We have delivered customized educational programs for the Three Gorges Dam in China, the Ministry of Presidential Affairs in Abu Dhabi, the World Bank, the Credit Unions in Barbados and the Canadian International Development Agency to name just a few. Our staff and faculty often “shift gears” to respond to the changing needs of our global community and we assist our clients/students to do the same. Our suite of offerings is diverse — from Developing High-Potential Leaders to Wood Dust Explosion Prevention, from Refugee Protection to Adobe Photoshop. We provide professional development programs that are career-specific to various professions that help individuals become better leaders within their organizations, and associations and organizations alike choose us to assist in developing programs to strengthen ongoing accreditation processes. Using the tools of program design and delivery, applied research, innovative teaching and technology, consulting, outreach and increased accessibility, the college partners with constituencies far beyond Dalhousie’s traditional student population. 4. We’re steeped in tradition and success. Many of our programs are substantial in duration and rich in history. The Transition Year Program, a one-year program designed for First Nations and African Canadian students who wish to enter university but who do not meet standard entrance requirements, is 45 years young (having opened its doors in 1970). 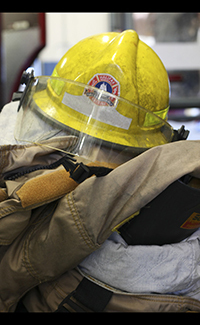 In 2016 we will celebrate the 30th year anniversary of offering courses to fire service personnel (both nationally and internationally) in our Fire Service Management programs. Our programs/courses are a balanced mix of traditional and trending approaches. 5. We host 250+ leading practitioners, professionals and academics among our instructors. Our local and extended network of more than 250+ instructors match our students in their diversity — of skills, experiences, backgrounds. They’re all committed professionals who are passionate about what they do, and our students benefit from their real-world experiences. These recognized leaders in their fields inspire our students by sharing what they know and gain enormous satisfaction from contributing to the learning of others. Learn more about the College of Continuing Education at our website. 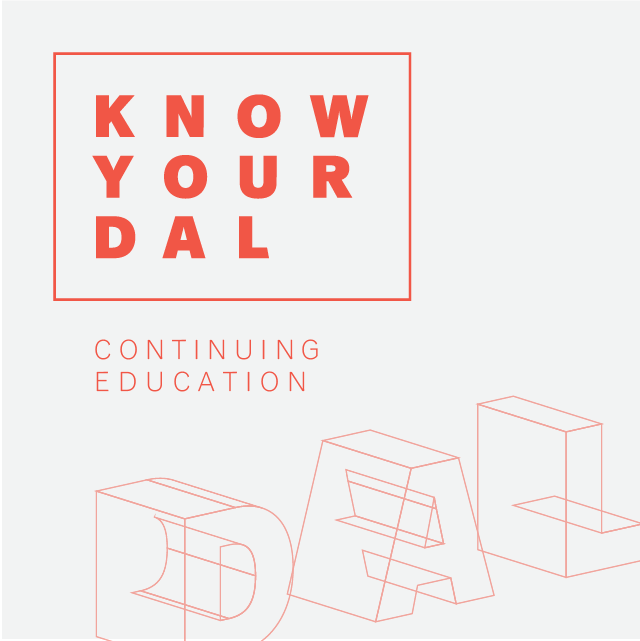 This article is part of "Know Your Dal," a 13-week series highlighting Dal's academic community. For more, including more content to come later this week from the College of Continuing Education, visit dal.ca/knowyourdal.